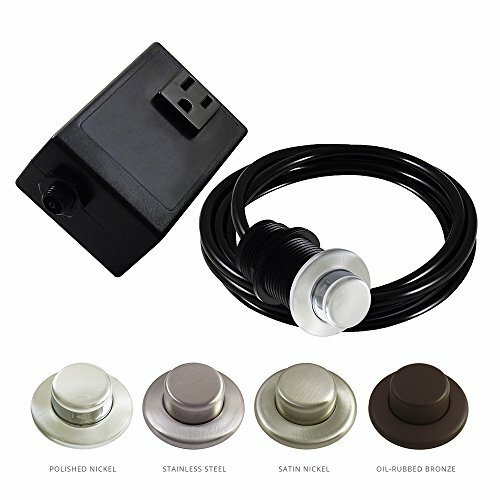 NORTHSTAR DECOR Single Outlet Garbage Disposal Air Switch Kit. DESIGN - Manufactured domestically with the strictest quality control standards, the flat design of the Power Module allows any Garbage Disposal power cord to fit Safely and Securely without any issues. Available in three different styles: Round, Square, and Raised, our Air Switch can complement any Modern or Traditional Kitchen Faucet Design. Air Switch kit is a stylish alternative to the traditional wall switch and a perfect fit for Island Installations and works with any disposer. CONSTRUCTION - Made in the United States, our Round Air Switches are Brass plated (except for White, Bone, Almond-Bone, Biscuit and Glossy Black - refer to color guide for more information). Power Module is UL and cUL approved and is compliant with US & Canadian standards. Made for indoor use, the 120V Air Switch can manage Garbage Disposal units of up to 22amps/1HP. COLOR CHOICES - Available in 24 finishes our collection will cover any of the faucet color combination needs. Our premium finishes includes: Stainless Steel, Polished Chrome, Polished Nickel, Satin Nickel, Oil-Rubbed Bronze. CONSTRUCTION - Made in the United States, our Round Air Switches are Brass plated Power Module is UL and cUL approved and is compliant with United States and Canadian standards. Made for indoor use, the 120V Air Switch can manage Garbage Disposal units of up to 22amps or 1.75 Horsepower and additonal equipment such as dishwasher. INSTALLATION & INCLUDED - Air Switch can be mounted easily through 1 3/8" diameter countertop hole. Kit consists 1 x Visual Quick and Easy Self-Installation Guide. 1 x Flat Grounded Power Module. 1 x 6" feet Air Tube. 1 x Choice of Trim Button.